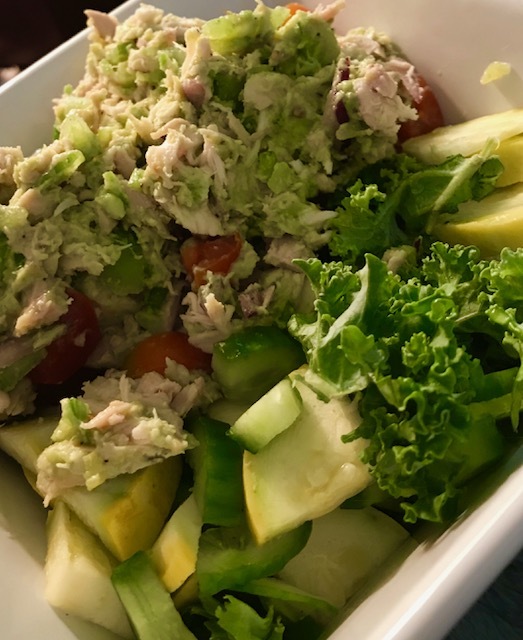 Chicken salad is always a favorite and there are so many ways to add variety. This recipe was sent in by one of our Genesis Health Solutions’ clients. When she had a craving for chicken salad, she creatively replaced some usual ingredients for ones that were plan-friendly. It’s a great way to think outside-the-box and create more variety in your meals. Mayonnaise, aside from making your own, is always one of those products that can be difficult to find with the best ingredients. Using avocado as a replacement not only adds flavor, but also provides a very healthy essential fat. This recipe is for one serving. Mix avocado, lemon juice, sea salt and pepper until creamy. Add tomatoes and chicken. In a bowl, place the kale or lettuce, celery, squash, onion and cucumber. Place chicken mixture onto lettuce. Let us know if you enjoyed this recipe!